This Casio Edifice Wave Ceptor watch is a bold model in stainless steel, set around a hi-tech dial, with silver baton hour markers, negative LCD displays and high-visibility luminescent hands. Accuracy is maintained by the Waveceptor technology, ensuring accuracy to the second, and the Solar movement also features alarm, chronograph and countdown timer, as well as world time function. The watch fastens with a chunky stainless steel bracelet with push button deployment clasp with Edifice Logo. My partner is very pleased with watch .the delivery was very quick .over all very good. I bought this watch for myself to wear to work. It goes nicely with a shirt, the metal bracelet is well made, and the watch fits nicely under the sleeve, despite it’s size. This is the first Edifice I own, I have 2 G-Shocks and was always impress how long they last and how well they’re built. This one is no different. The solar powered mechanism will ensure you never have to change the battery again, although, from my experience the re-chargeable battery needs replacing after about 5 years or so. Great time keeping thanks to daily updates. The only downside of this watch is the lack of full date on the front screen. The only option that shows is the day of the week. Otherwise, a great purchase. BOUGHT FOR MY HUSBAND HES GOING TO LOVE IT. This is best watch I ever had! Such a great watch ... it looks amazing the photos on the website dont do it justice ... its got a nice weight and is very comfortable to wear.. i cannot stop looking at it the light is great and love the overall look of the watch .. i will be looking at more Edifice watches from Watch Shop to add to my collection .. Disappointed. Very hard to see digital display and quiet alarm functions. Very reliant on solar power. Poor back-light. Solid build quality. Firstly this is the frist watch that I have purchased from this site and the service is great, the watch itself looks better in the flesh and a solid watch,the only gripe with this Is that the two display are not bright enough to read in the light. purchased this watch because it looked good and had featured that were desirable. had missed out on getting the strap pre adjusted so had to sort this, but found that either it was too lose on my wrist or just a little bit snug. but i guess this is my wrist being a strange size. the watch feels good and is quite chunky which I like. Had an issue when went skiing, as this watch adjusts the time automatically. well actually it didnt. no matter where I was in the french alps it would not adjust to the local time. instructions do say that in mountainous regions it may not work. so had to make do with the time being an hour out. so when I went to shanghai, I did not expect to have the same problem. alas I did. again the primary reason to wear a watch is to tell the time. which this timepiece doesnt do outside the UK. others in my party tried unsuccessfully to make it re calibrate but no luck. Edifice is probably the most underrated watch and is equal and in most cases surpasses the more expensive designer or high end watches. 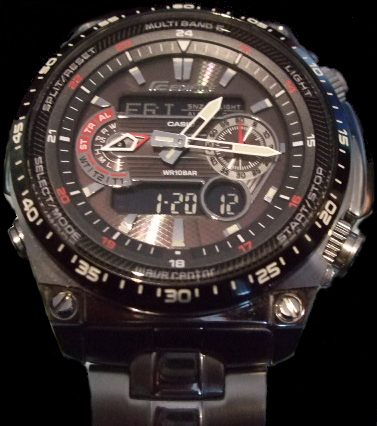 This is my second edifice and purchased not because anything wrong with my other but because I like watches and the new model offers the radio controlled feature. The purchase from the Watch Shop was easy and trouble free and recieved the following day. I am really Impressed, this watch is looking even better in hand, and on hand. This watch is brilliant, my main point was the solar powered solution though. I going to use it on every occasions. I had no any issue with set-up, the key was to read the booklet before any touch as it is a watch with fulfilled many options. Not easy to set for first time for sure, but it was not a surprise for me. WatchShop processes are really smooth and quick. Use to I order products online many times every months from other vendors, and I never have been impressed in this level before as I am with this e-shop. Excellent watch, style and chunky, good functions, supports many radio time zones, although the solar powered element takes quite a while to charge the battery. Great watch.So quick delivery and well package.Beatiful watch. 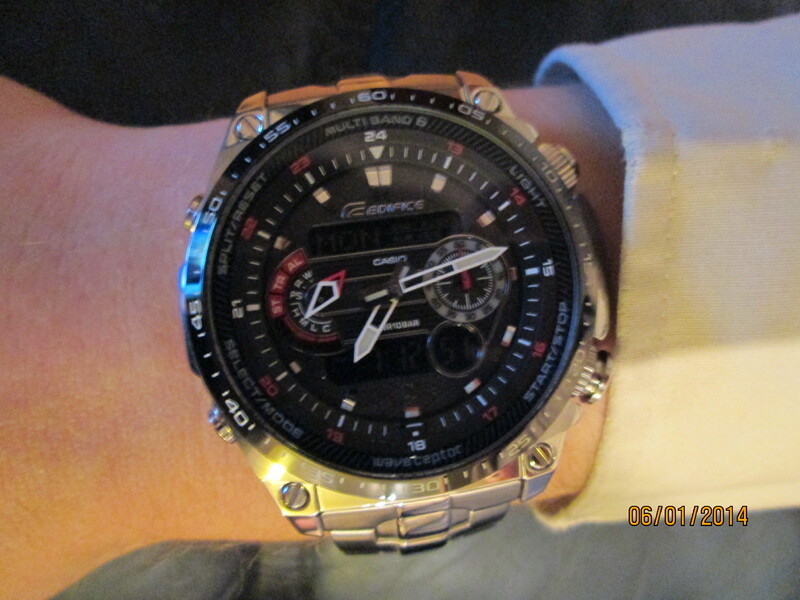 I have owned this watch for just a few days, however, I knew what I was getting being the owner of other Casio watches. It is certainly very rugged looking and has a real feel of quality about it. For example I could not help but notice the four screws securing the bracelet to the watch body are perfectly aligned. Just look at the screwdriver slots and see how the diagonally opposed screw heads are pointing in the same direction. This is precision drilling to match the length of the screw. Attention to detail like this equates to a watch that no doubt has quality oozing from all aspects. Just picking the watch up you can feel its weight, this is not a watch you will forget you are wearing! However, for a watch of this calibre and functionality, I don’t mind the weight. Unlike the photo on the web site which gives the watch a dark blue face, the actual colour is grey. It’s not unpleasant and partners well with the white coloured hands, silver hour markers, and a smattering of red for the stopwatch dial hand, and mode indicators. This is a Tough solar watch which means it’s powered by light that charges a small rechargeable battery. Fully charged the watch will function for around 6 months without light. However, keeping the watch face exposed to any light source will keep the internal battery topped up. Like all rechargeable batteries, they have a life-span and over a long period of time in the order of years, the battery may not be able to hold as much charge and the 6 months may reduce. I really don’t believe this is an issue as the batteries are easily changed by a jeweller if required. I have replaced one of these batteries myself on the very first Casio Tough Solar watch and that was several years ago, but other tough solar watches have never needed their batteries replaced yet and have lasted 7 or years so far with no signs of reduced capacity. Solar watches nowadays are very good and reliable. It’s an amazing watch, automatically picking up the time signal from just about everywhere in the world and setting itself in the early hours of the morning. Truly a watch you can wear and never have to set or worry about the battery, unless of course the backlight and alarms are used excessively, more on this later. 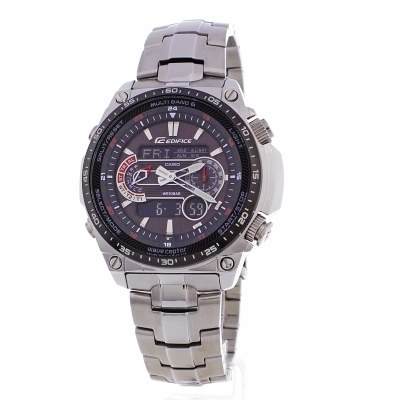 The Casio ECW-M300EDB is a multi-function watch to say the least! It has no less than five alarms, one of which is a potentially very useful snooze alarm. If you, like me are someone that likes to sleep in longer and hits the snooze button to grab a few more minutes of shut-eye well this watch provides that feature. Press a button and the snooze alarm will shut up for five minutes before commencing its nagging. There is the usual hourly time signal and four normal alarms which could be very useful to use as reminders. If timing sports events is your thing a stop-watch is provided with the usual lap-times capability and can measure to 100ths of a second with its little LCD display and seconds on the stopwatch dial. The stopwatch dial only displays seconds for the first minute thereafter records minutes for an hour and after that hours. Realistically, the human reaction time is way slower than 100th second, and so timing anything beyond 15ths of a second precision is not going to be accurate. Nonetheless, this is a human limitation and not a fault with the watch. Additionally, this watch sports a countdown timer that can sound an alarm at the end of the count Useful for boiling an egg for example! If travelling the world or having an interest in time-zones then this watch is well equipped. It can display the time in 48 cities, 29 time zones. The home time is normally displayed by the hour and minute hands whilst the other cities time may be displayed on its tiny LCD screen. If frequently travelling between two destinations the home city and destination city may be swapped so that the destination cities time is then displayed with the hour and minute hands, the home time on the LCD. This feature is also handy when going on holiday and wanting to know what time it is at home or if you have relatives that live abroad and want to avoid calling them in the early hours of the morning or too late at night. There are many comments about the backlight on this watch. I purchased it knowing exactly what the backlight would provide being the owner of another Casio with a similar but not so bright light. Many have indicated a slight disappointment that it does not illuminate the LCD display and I can understand this point of view. However, I believe that Casio have actually done the best thing when considering the amount of energy the backlight uses. According to the manual a single backlight operation will required 5 minutes of charging in sunlight to replenish the energy used and up-to 8 hours from indoor lighting. If the backlight also illuminated the LCD panel then I imagine more energy would be required. When considering this and for me at least, I would probably only need to know the time perhaps when out for the evening. In this situation illuminating the LCD to know what day or date it was is less likely to be needed. I suppose Casio could have added another mode to change the amount of backlighting provided but I really think they made a good and realistic compromise here. I really like this watch, it has everything I want and more. I like the build quality and think it’s a very exciting watch to own. If I had one negative it’s that the LCD display is a little small and so I need to wear reading glasses to see it clearly. This is probably just a problem with my eyes, but a slightly bigger display would have been nice. Overall, I think this is an excellent timepiece and certainly will be one of my favourites. Many people regard Casio to be entry level budget priced watches, but the Edifice range blows that theory out of the water, this model is up there with the big boys in designer watches. Everything you would want from a chronograph watch, just set the time zone and the watch keeps perfect time. The same watch with the Red Bull logo would cost an extra £100+. JUST one tip, the bracelet watch strap has small easily lost bushes in the links, so let the Watch shop adjust it Free Of Charge. Very pleased with this watch, looks great and made a very nice Christmas present. Love the watch, nice big & chunky. This was a gift for myself payed for by my sister who told me to choose a watch & something Ive been looking for, only had a quick play with the item as she wants to I grave there back. Overall I love the watch, usually have problems with the wrist size as I have thick wrists, very impressed with bracelet size that is actually loose to wear. The features of the watch is impressive just let down by the poor watch light & hard to read digital display but still love the watch. As this watch is a gift for my grandson who is 18 in January I cannot confirm his feedback. The watch looked very good & I was very impressed with the speed of delivery and ease of collection. I thought I had written a review but obviously it didnt get through. So here goes,! 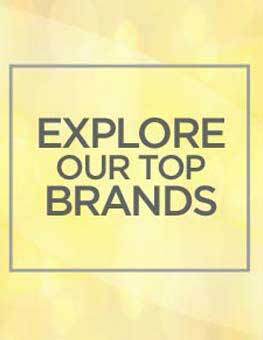 First off I thought your site was easy to navigate, secondly you presented your watches clearly with the relevant information, thirdly youre prices are unbeatable and finally your service is excellent. I have never had better service anywhere. Thank you. Easy to navigate throughout the site and order ,no hidden charges , Ive order the watch on Saturday and arrived Monday morning plus I was kept update the whole time by watch shop on the progress of the order. I will definitely order again from watch shop because the prices are very good too . Brilliant product, really fast delivery. Unfortunately, adjustment wasnt quite right and I had to pay £8.00 locally for another link to be taken out. Followed sizing guide very carefully when ordering. Just one of the perils of mail order shopping, well worth it for what I saved on the RRP. Received as a gift. Totally delighted , just what I wanted. Am a fan of Casio Edifice watches and this is my 3rd one. It lives up to the innovative Casio design and useful features. I chose this watch for its day and date display, radio controlled timekeeping and solar power, in addition to its many other features. It looks rugged, stylish and functional. Would have liked an option to have black symbols on a white background LCD display, but thats only a minor criticism! Excellent product! Very stylish. Reasuringly heavy. A christmas present so no husbands view as yet. 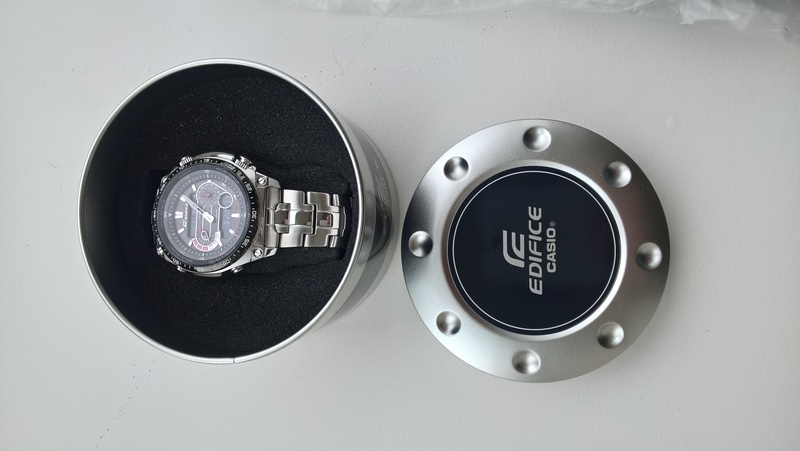 I have wanted a Casio edifice watch for some time and my wife offered to buy this for me as a present. I was pleasantly surprised when I found a version of this which not only calibrates the correct time, but is also solar powered and has the features I like. The bracelet is very large compared to my wrist and I am currently arranging to have a third link removed after thinking that two links would be sufficient. Is it not possible to ask for a wrist measurement at the time of the order and despatch the watch with the appropriate number of links already removed? This is my only gripe as I was so impressed with the watch and the next day delivery even when ordered over the week-end and the secure packaging, when it arrived. Looks great, reassuringly heavy, no husband input yet as its a christmas pressie. Although I love the look of the watch,my only criticism would be that the display is hard to read. When I first got the watch I had to shine a torch on it to see the letters on the dials.Was expecting more functions after reading reviews. saw this watch in a recent watchshop news letter,had to have it ! it was delivered promptly as usual.what a stunner!! every thing you could expect in a watch,solar powered &auto time adjust.3different times possible,stop watch, countdown timer,5 alarms,auto light etc. perfect for the man who likes things to play with. I bought this watch to my partner for his birthday. Hes a big guy and likes chunky jewellery : He definitely loves this watch and is really happy with the precision it works with. I would highly recommend it! Beautiful watch from Casio, love the feature of solar power so that I do not need to buy and pay for installation of a new battery and never having to adjust the time because it is radio synced. Well built and elegant. What is missing is the seconds arm, I have to look at the digital second which is not always that easy as the led is white on black, on low light it is almost impossible to see. I bought this casio watch for my self the two main reasons being the waveceptor and the solar powered technology once set up the watch it will calibrate with the atomic clock each night whilst you are in bed asleep and also because it is solar powered meaning no battery changes. The other features i liked on this watch is the dual display you can have the analog hands showing you the time and the digital display showing the day of the week the month and the date it also counts the seconds in a circular digital display. It also has other great features like like world time, stopwatch, countdown timer, alarms. The case of the watch is highly polished stainless steel with a black fixed bezel the stainless steel bracelet is brushed on the outer of the bracelet and the middle is highly just like the watch case highly recommended product you wont be dissapointed. I would like to thank watch shop for A1 service. The watch is multifunctional and generally very nice looking. My only criticism would be the digital inset screens where you see the day and the time in digital format. Unless you are in bright sunshine they are almost impossible to make out. The automatic illuminating light is convenient. The instruction guide that accompanies your purchase is really bulky and not entirely self-explanatory. I got there in the end with setting my local city. Probably would not purchase this product for a gift. This watch certainly doesnt disappoint, looks even better than in the picture, people have already commented how well it looks on, would highly recommend. Absolutely astounded at the delivery time, honestly did not expect it to arrive when I wanted it to, but it sure did over the moon with the watch always wanted an Edifice now I have one well pleased, I would recommend Watch shop to anyone looking to purchase a new watch. Communication was excellent. very good looking watch delivered very fast..
As always, first class service. Ordered 1st day delivered next day. Bought it as a gift for my dads 50th! Came well packaged in a lovey box! He loved it, looks a lot more expensive than it is! A lovely solid watch, great weight. The face size was a little smaller than I expected and the backlight isnt much use. The fit was a little big for my wrist. Service from the watchshop was excellent with great communication. Will definitely buy again. Exceptional timepiece, very easy to setup. Watch came on time and was as ordered! Took a bit of time to get it all sorted out, especially the DST setting the watch was an hour behind DST even with DST set and day/date display selection was not covered by the quick guide button D. But the radio synchronisation now appears to work each night. Looks good on the wrist and has a million and one modes, so whats not to like? great watch, and great service. ordered on sunday, and recieved on Monday! Previously owned a Casio waveceptor and loved it. This is even better. It is quite heavy and the bracelet is very large. Easier to use than my old one even though it s got more uses. Date is obscured when minutes hand is at half hour. I really like it. 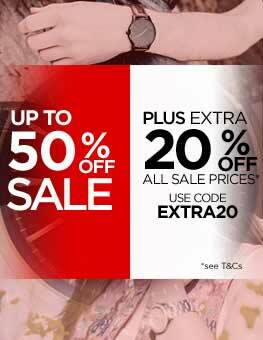 Watch is extremely good value for money at virtually 2 thirds of high street prices. Works very well with all the functionality and robustness we have come to expect from Casio. A couple of minor gripes are that the supposed illumination is only in fact a tiny yellow led and is altogether useless in the dark. Although the luminous dial is very good and I thought the instructions could be a bit better written. Also I had to remove a couple of the strap links...easy job if you get one of the cheapie link removers. Otherwise Virtually any jewellers will do it for a small charge. I love this watch, I prefer watches that have both analogue and digital interfaces but am not bothered about the new trend in short battery life smartwatches. For me alot of the decent watches with both have poor quality LCD screens or try to something to outlandish but this watch is perfect with its black watch face with the subtle negative LCD screen also being black with white text rather than the cheap looking grey. The watch is a good weight and is not to large, looks classy, classic and expensive without looking too bling or too futurist. Some of the functions are great and its packed full of nice features to make you feel your getting value for money, like the radio timecode, the motors driving the rotary arms to set the time ect, and the different time zones, and lets not forget the solar charging watch face meaning and almost life lasting device if you take care if it. Alot of other reviews said the watch was let down by a poor backlight, and while I agree a full led watch face illumination would have been better, the orange led is ok if you angle the watch away from you you can read it find its only looking straight on the LCD display cant be read. Great watch, great service from watchshop..
my watch and your service is and was everything i expected, exceptional as before, i can and could not expect any more, many many thanks and look forward to future purchases. Fantastic watch! Really happy with all the features. The watch looks professional, has a nice weight and sturdy feel. The watch shop service was fantastic and quick. I like the build quality of the watch and the easy to use functions. I do not like the watch light as it only illuminates the analogue display and not the digital display. I ordered this watch on Friday night, was delivered on Monday morning, perfectly adjusted to fit, and even better Watchshop honoured a priced match and took £127 of the asking price. It doesnt get better than that. The watch itself looks way better in the flesh, good solid watch. Havent had a play with it as it from Crimbo and going away:. Great watch, does exactly what it says on the tin. Delivery was excellent, well packaged and arrived the next morning. beautiful watch - high quality product well worth the money. only down side is that its a bit tricky to set up, but CASIO cust svcs were fab and talked me through it. Was really impressed with this watch when I saw it on the site and even more so when it arrived. A nice size watch on your wrist without it feeling too heavy. I love the way the left dial goes round when you change mode and how it displays the solar battery status. Cool touch. Numbers on the digital display are the perfect size with them being easily readable but not over intrusive. 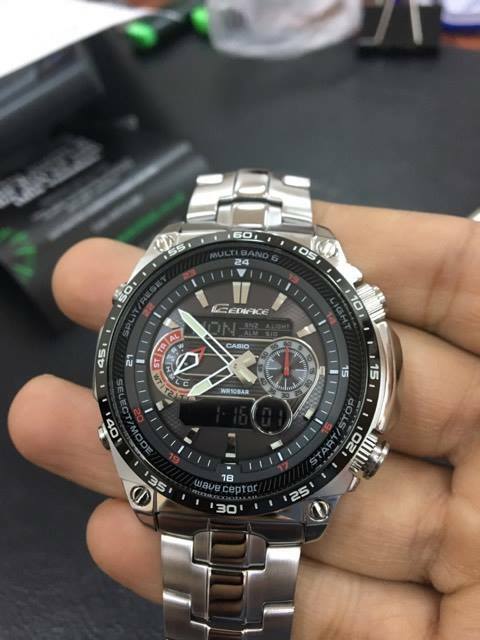 Build quality is what you get too expect from Casio with quality not compromised for design. Cant get this sort quality for most watch under £300. Must buy! The watch arrived fast enough, and well packaged. However although my instructions to reduce the strap size were included in the package, and highlighted with a highlighter pen, the re-sizing had not taken place. As this was one of the main reasons I chose this site I was disappointed. I dont see the point in reviewing the product itself, that was fine, and after getting it re-sized I wear it everyday. Overall I was very impressed with the watch. The biggest bug-bear was trying to adjust the strap. Other than that, the watch has the look that I wanted and the features as well. i like the features of this watch. the only thing i did not like was the LED light it doesnt stay on for long. the watch is a bit too bulky looking however it depends on what your going for the features or its look. This watch comes nicely presented within fitted foam cushioning in a large round navy and silver tin featuring the Edifice logo. There is also an outer “easier to wrap” glossy cardboard box of the same style, which I appreciated as it was a birthday present. The size of the box is larger than one would expect for a watch, making it harder for the receiver to guess what it is! Having only seen the watch previously as a picture on the internet, I was very impressed with the real-life item. The face is large against the wrist, with all the parts easy to read without needing to hold it up close. The dials and aesthetic details are exactly as I expected from the ad photos. The metallic markers, dark background with reverse negative displays and splash of red text give this watch the sophisticated look I was after for my husband. The stainless steel bracelet finishes the expensive look and feel, making it quite heavy at nearly 200g. Most men will probably need this shortened, which took a few minutes at a local watch repair place. As the watch is solar-powered, I was a bit worried it would be dead after spending so much time in its box. However, this was not the case and the display brightened within minutes of being exposed to normal indoor lighting. Now, the first thing “boys” yes, this includes 38yr old men like to do when they get a new gadget is take it out the box and press all the buttons in a seemingly random order. Or maybe it’s not random maybe there’s some male methodology to it which I am ignorant of. Anyway, this is not a gizmo you get the hang of by trial and error as it has a lot of functions for four buttons to access. Firstly, you need to read the manual guess who ended up doing this and set your home city so it is reading the correct time for your time zone. Then, you should calibrate the hands as they may be pointing slightly off if the watch has been exposed to any magnetic fields. The instructions are well-written and set-up is not complicated if you read them carefully. The manual is available from Casio’s website as a pdf for anyone who finds the supplied one a bit fiddly. The main selling points for me, as well as the look of course, were the solar rechargeable battery and radio-controlled timekeeping. As I mentioned, there seems to be no problem with the former, although time and usage will see how it holds up, and the latter is working very well. The watch receives an automatic signal once during the night to maintain accurate time. You can also do a manual receive whenever you like. I’ve had no problem getting the signal at my property in North Wales. Certain functions require a two-second button hold. However, I found that only briefly pressing the button could activate these functions occasionally. The other thing I was a bit disappointed with was the light, which is a yellow LED situated at the 6 o’clock position. It doesn’t illuminate the whole face evenly and looks a bit “cheap”. In my opinion, a backlight would have looked smarter. Despite these minor niggles, my impression and experience of the watch so far is very positive. One last cool thing I’d like to mention is how the light comes on automatically if you hold your wrist up in the gloom you can also turn this feature off if you prefer. To finish off, this is a very smart expensive-looking watch and has all the functions I would expect for my £220.00: World time, alarm, water resistant etc. There’s a chronograph as well, although it’s definitely a “going out” piece and not something to wear to the gym. The main appeal for me was the solar battery and the automatic timekeeping, hopefully making the watch maintenance-free and a long-term favourite. Overall, I am extremely pleased with my choice and would definitely recommend it for a budget around the £200 mark. very nice looking watch and has a feel of class about it. Instruction book looks a bit daunting! Lots of great features such as solar so no need to change the battery and radio controlled so always the perfect time. A good size but a little but weighty. The watch was bought for my husband, and he loves it. He has always liked watches with various dials and bits and pieces on the face. This is the first radio controlled watch he has ever had and he found it so easy to set up, usually he is on ages with all the other watches he has had. Looks good and solid, very pleased. The watch does all I want a watch to do and looks good too! The radio controlled time update is great. Some reviewers have complained about the weight but I have not found it a problem and I am no Arnold Schwarzenegger! The backlight is a little dim but I have no issue with that either. The energy save setting is good as it drops into bare minimums during exposure to night-time darkness and kicks back in as soon as a little light is available, all good for battery life. Not a bad price either! The proportions of the watch are great. The dual time function is really useful if you deal with two different timezones. The back light isnt very good unless its really dark. The LCD is very hard to read when using it. The watch looks great, I like the waveceptor as I like to have my watches right to the second, the menu is fairly simple, and I like the digital displays as well as the analogue display. I also like the solar power and how quick it charges up in bright sunlight. Dislikes, a little on the heavy side and the strap needs a bit more adjustment ie half a link,the clasp only has two adjustment holes,but it is still a quality strap and clasp. Excellent watch very easy to read even though there is a lot of information on the dial. Function buttons are easy to use and strap was easy to remove links. A very solid watch and everything I expected. Looks even better than in the picture. Took a while to learn how to operate it as the instructions werent too clear, once mastered, the watch is easy to operate. I bought this watch two weeks ago. I am very happy with it. Very easy to use. As I am a person traveling throughout Europe much, I appreciate the opportunity to change the time zone with two clicks - exceptional. Unfortunately, in central Europe I was out of service, to correct the time using the radio calibration. Nothing big, however, I hope that broadcasting stations in that region will be built in the future. Face of the watch is very clear, you can see everything both at day and at night. Since I have a rather girly wrists, I had an issue with adjusting the length of a bracelet. I think there should be yet another level of regulation on the clasp. Otherwise without half-links accurate adjustment can be difficult. In summary sensational watch - I would buy it again. WATCHSHOP is the best watch company I found online shopping. It was a fast service, I ordered on Friday after 3.00pm and received the watch on Saturday 8.00am whilst I was still in my pajamas. its great watch with great service from WATCHSHOP.Well done Guys. Very highly recommended Thanks once again!!! Very pleased with by purchase - looks better than in the picture and having compared prices, much cheaper than in the shops. Every review on this watch stated the inefficient night light. If its dark enough it does the job! Of you want brighter then with the several hundred points pounds you save from Not buying a breitling etc buy a very expensive torch. First thing you are confronted with when you open the box is the size of the Instruction book and its small print. If like me your eyes aren’t what they were, google “Casio 5117 module pdf” which gets you to the Casio website download for the pdf version of the manual. It’s a lot easier to read while you get the hang of how this watch works and can keep the pdf on the phone/tablet just in case I need it in future. Once I set my home city things became a lot clearer on what the buttons do and how to control modes etc. What did immediately strike me when I first looked at the watch face is how dark the digital displays are. They appear a lot darker than the watch shop website images and have put off at least one previous reviewer. Thought it might put me off as I am used to black on white until I was outside and realised how much easier to see white on black is in bright sunlight. Pretty easy to set the screens to display what you want them to. Instruction manual proves to be simpler than it first appeared. When you wear it you know its on your wrist, it has to be the heaviest watch I have ever owned but it really is well designed and constructed. I have owned a previous Casio Waveceptor Tough Solar which had part of its case made using metal coated plastic, when the metal coating came off it spoiled the look of the watch. This case is all polished metal and a far superior quality, it looks solid, functional and elegant. In use the watch is very clear. The 5 alarms are really useful as I need to take medication throughout the day. They would be just as useful if you have a busy life and need to be reminded about the kids taxi needs! The alarm volume is a little quiet and it might get lost in noisy environments. I find the countdown timer quite useful when cooking. The solar charging and the Radio Time Control were specifics I purchased the watch for. No winding, no shaking, no batteries and always the right time. I like the contrast between the hands and the face background, it means the hands are very visible even without my specs!. However the hands at times obstruct the digital screens. This can be a problem if you happen to want to make mode or setting adjustments at this time. The hand coating means you can see the hands in the dark and the LED light adds further to illumination. I can see why some reviewers question the value of the LED light as it does nothing to illuminate the digital screens in the dark. Like them I would have preferred Digital Screen Back lighting but not a big deal as the watch has so many other positives which includes the price Watch shop do it for. Bargain! Cant finish without mention of the Watch Shop delivery. I ordered midday yesterday and even with the free delivery it was delivered at 8.30am today! Less than 24 hours start to finish, that’s service. The watch appears a good buy, and certainly classy technology on the wrist, but not without some criticisms. Very good watch - looks absolutely fantastic, lots of features, good price and really easy to see/use! Firstly, this is the second watch I have purchased from Watchshop and the service cannot be faulted. From confirmation of order to receiving the watch the following working day, together with progress e.mails, I have found dealing with Watchshop to be totally impressive. Price of the watch. Some £73.00 cheaper than at the High Street - speaks for itself. The watch - photographs do not do it justice. Looks and feels brilliant, quality materials and I love the array of the various settings available, alarms, worldtimes, etc. Totally suitable for both informal and formal wear. Took minutes to set up the other settings do take a little time to get used to. However, once done, a bit like ridding a bike once done not forgotten. The size and appearance is really brilliant. Weight wise, yes it is heavy, but feels right for the size of face, etc. In conclusion, in my opinion, the watch is generally outstanding and fantastic value for the price. Upon opening the tin that contains the watch you are presented with a comprehensive instruction manual which looks a little daunting as it must be about an inch thick. Not to worry though as it covers many languages and only a few pages need to be read. For those who just want to wear the watch and worry about the intricacies later, a basic set up instruction sheet is also included. Simply set your country and within a few seconds your watch will update to the current time and date. Even the main manual is easy to understand. I have had my watch for over a week now and can quickly navigate my way around. It is slightly heavier than my previous watch and I was quite conscious about it initially but I have got used to it now.The only downside that I have come across is that the hands can obscure the view of the digital display and certain times of the day so a home function would be good to move the hands out of the way. Other than that I have had no problems and have found the watch to be very versatile.The alarm sound is brilliant, instead of the normal high pitched electronic shriek that comes with most watches, this Casio has something akin to a ping and then an echo, very pleasing to the ear! Would I have bought it knowing what I know? An infatic YES! I nearly bought a Citizen EcoDrive watch with very similar features but found it very light and unsubstantial when I tried one on. The Edifice by contrast has a great chunky feel that matches its ruggedness - and for less than half the price! I do a lot of international travelling and deal with clients in the US and Australia, so the time zone features were one of my must haves along with stopwatch and alarm - all of these work really well for my needs and are pretty easy to use once youve read the instructions. I love the feel of this watch on my wrist, its big enough without being over-sized and the strap is easy to size correctly I followed a useful you tube clip to make sure I did it properly. As well as the practical features I needed, I wanted a watch that looked good as well - premium appeal without being a flash brand I dont want my clients to feel Im charging them too much! - and the Edifice does just this. Initially I wondered about the naming but I guess Casio are trying to do a Lexus/Toyota type thing with the branding. 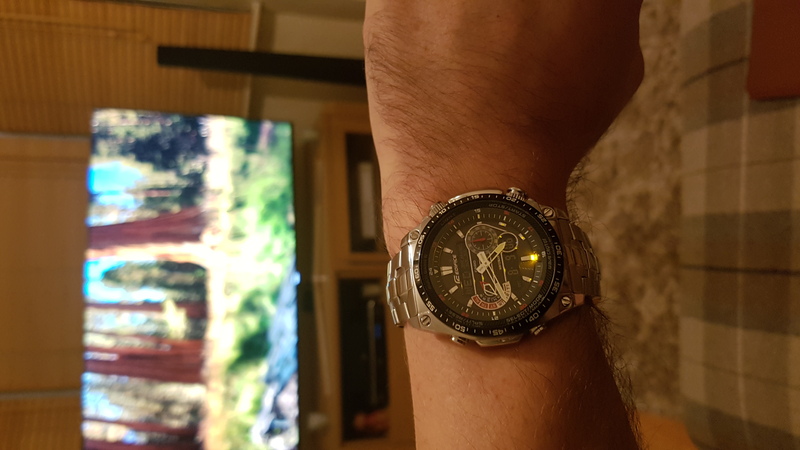 A few weeks in and the only slight criticism is that the nightlight only illuminates the hands rather than the digital readouts as well a bit annoying at times, but not the end of the world and hasnt spoilt my enjoyment of the watch. What a fantastic watch. Smart, comfy and another corker by Casio. Ive always been a fan of Casio & Ana-Dig watches and this seemed like the ideal one for me. The strap is comfy, Ive had problems with previous with metal straps as they sometimes catch the hairs on your hand, but this one is good. Overall - a superb watch and a big thank you to the watch shop for superb delivery! I will be using your service again! my order next day at 9 50am. Excerlent. Fully featured watch, very nice design. Slightly disapppointed that bracelet is not user adjustable - have yet to get mine adjusted to be able to wear it. Four alarms, countdown timer, worldtime, stopwatch, radiocontrolled and solar powered. An excellent watch. Just as described, colour size, functions etc. Has kept perfect time since I received it. Very pleased indeed. I travel a lot for work and really like the Timezone feature. Also the radio accuracy is a great help to stay on time. The watch feel good and exceeds my expectations. A small criticism has to be the non lid up LCD displays. But its great value for money. excellent watch, very pleased with quality, a little difficult to set initially but once familiar with different settings found it to be reasonably easy. Liked the look and the feel, currently looking for another one for my husband who doesnt need it to be waterproof. 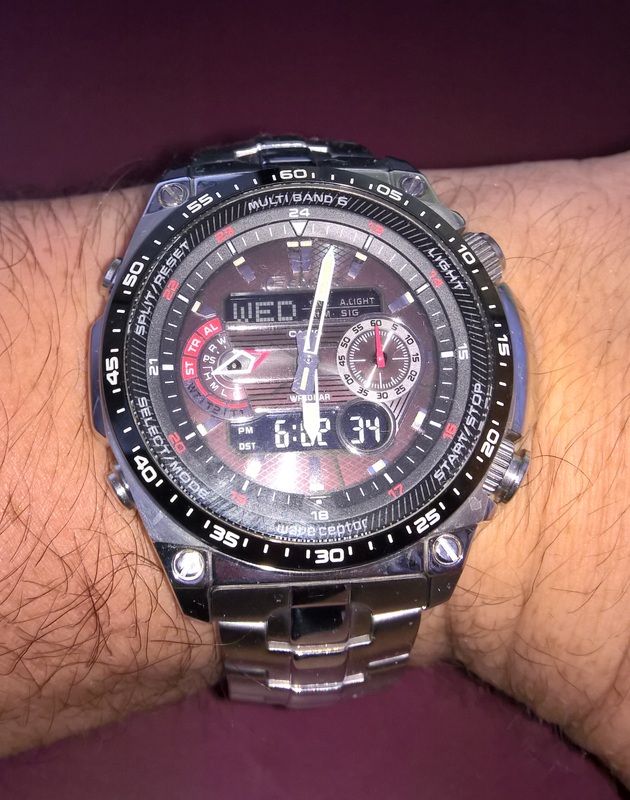 Been looking for a watch for a while and really liked the look and features from the Casio Edifice range. I had my sights on three similar looking edifice watches the reason why I picked this over the others is not only the price which for the many features you get the is excellent but the look and design of the watch did it for me. The design of watch face is great with many watches the watch face is usually stuff full of confusing dials but with the digital readings it free up face whilst stilling having the great many features this watch has. Setting up this watch is simple and quick have herd people having trouble but haven’t got a clue on what they were trying to do only took me about a minute. Once set up you no longer need to set the time it doses it for you which is a big plus. Another big plus for me is the solar power to charge the battery is doesn’t take to long to fully charge, takes less time to charge then going in to a watch smith to change the battery. Yes some of the other reviewers are right the digital readings are unreadable in the dark and the backlight doesn’t really help ether but so what for the amount of features you get the fantastic look and for the price these small minuses are nothing. Over all this watch is fantastic it full of excellent features, great looking and feels well made, with only one or two minor problems you will not be disappointed. This watch was exceptional for the price,looking a lot more expensive than what I paved for it,only downside,which really isnt a major issue is the digital readouts are quite dark,but this was a small issue and really doesnt detract from what is a very techie watch.deffo worth the money and would recommend to anyone wanted a head turning timepiece. I love this watch. It has class and style and can do pretty much anything. Promptly delivered foolwing day after order. Nicdepresentation. Read reviews on the watch so was not surprised at how it looks and works. Does what it says on the tin. It would be helpful to have a park position for the hour/minute hands to enable easy viewing of digital figures but it can be lived with. A great watch all round. Plus points: functionality is awesome - it does everything you could possibly think of and more all packaged into a very stylish watch. Negatives: the light is not great and so you cant see the digital display at night. Overall very pleased with the watch and the excellent service receievd from The Watchshop. I really liked this watch and my wife birthday gift, she found on the Internet cheaper than the store. Very good design and very nice on the hand. Settings fun and still not been clarified until the end but the basics have identified. I can tell you this watch is worth attention. I spent a long time looking for a new watch to compliment my Seiko Premier Perpetual which still works fine after 4 years. I considered the expensive options such as Omega, Breitling and Tag Heur but the massive initial outlay and the ongoing service costs as they are mechanical put me off in the end. The Casio dual analogue/digtial display was important to me and the endless list of functions on this watch such as 5 alarms world time and stopwatch, countdown timer etc are invaluable. The most important factors for chosing this watch were its awesome styling, the Atomic Clock accuracy and the Solar Powered Battery technology which set this watch apart from the crowd, just wear it and forget it! At this price the package is a real deal. 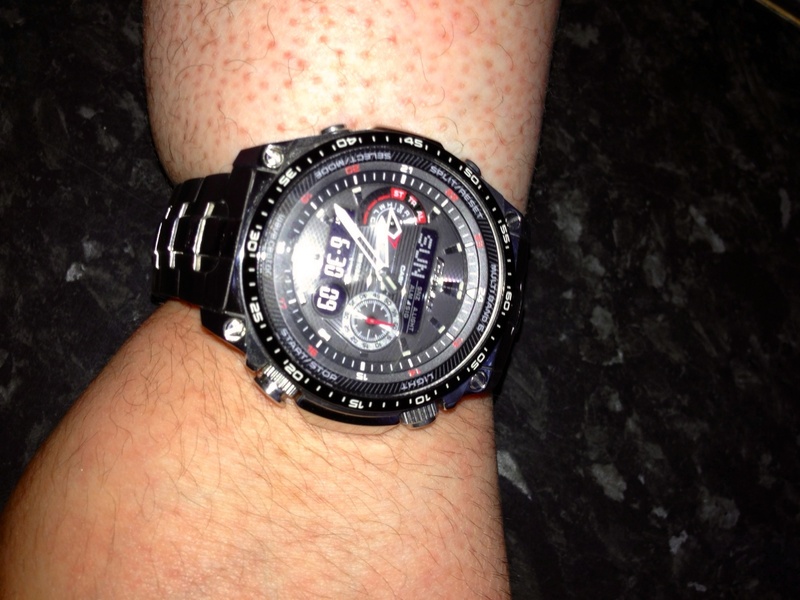 Do not worry about build quality, This is a high end Casio and it is every good in the flesh as it is in the photos. A big thanks to Watch Shop who sized it for me and delivered it next working day. I have been looking for a new watch for some time, and then I found this great piece of art. Many features that is useful, specially the autolight and solarpower. The only minus is the weight. Had this watch for a week now. Very comfortable to wear for what is a chunky watch and it has a bit of weight to it, after a few minutes I forget its on my wrist. The face is very easy to read and the instructions, though comprehensive, are easy to understand so it was easy to set up. Syncs every morning with the time signal as described in the instructions and I checked the time with an online atomic clock and it is bang on the second so not only is it a great looking watch but it is very accurate. There is nothing to not like about it so I would highly recommend this watch. Great watch. Has a nice feel to it. For such a bargain price too it was a real catch! Colour of watch face is more red then shown in pictures. But nonetheless the watch is still classy and will be worn every day now! Ordered the watch initially from Amazon and paid extra for fast delivery - didn't arrive. I got a refund two weeks later. Ordered it from Watchshop and it arrived next day. The watch is great, chunky in a good way. When I've had Casio watches in the past they are light and feel delicate but not this one. Does everything I want and looks good. If yo u're not sure then just go for it, you won't be disappointed. Bought as a present for my husband who delighted with it, lovely looking watch and according to him very comfortable to wear. 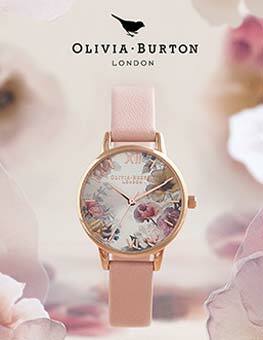 lovely watch. Watch was ordered on Friday and arrived on Monday by standard post well packaged and protected easier than buying from the shops. Very nice watch, even for a 45 years old man. clear to read and relatively easy to set up. Not too big, not too small. A tad heavy, but there's a lot in it. I love it. quality bit of kit this. from the packaging to the build quality. oozes class. once you've set your time-zone hold the top left button for 5 seconds and it'll via radio (and at 2am from here on in). simples. it isn't too heavy (lighter than my other edifice) and feels great on the wrist. the dials can be a little confusing but the manual will help (good also if you download the pdf version from casio's website...easier to read). it'll illuminate using an orange l.e.d at the 6 o'clock position when it's dark and you turn the watch to read the time (although there's also a dedicated button for this). the hands glow for a loooong time after exposure to light though...so you may not need this to see what time it is in the middle of the night. this should be the last watch i ever need to buy. solar? yes. radio controlled? yes yes. fantastic piece of engineering that's slightly geeky but very visually attractive. recommended. Excellent watch, very pleased with my purchase. Very good quality and looks terrific. Easy to understand instructions. Some people mention that the hands cover the digital display details. This is true (but surely this is applicable to any analogue watch with any form of digital background?). You can still read the information fine. Very nice watch to look at and built to last. Upgraded from a G shock solar. The watch has many features but it was very annoying to set up at first, even after reading the manual a couple of times! Having now owned the watch a week or so the functions are becoming easier to use and people are commenting how nice the watch looks. All in all a very good watch with one minor drawback, the back light. If you want to read the digital display at night using the back light forget it. That being said the watch more than makes up for this design flaw in other areas. The watch is awesome. I had already seen the watch before and knew its good. The delivery as very prompt and was constantly kept d bout the status. The packing was very good and the gift box was a pretty nice one. 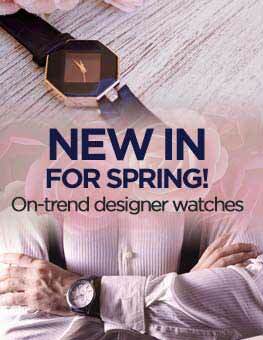 Watches looks very cool! A lot of info can be viewed on the clock face. Easy to view time in the night (pointer) without light. You can use 5 different alarms and more more additional futures (stopwatches, timer, world time etc.). I am very satisfied with these watches! Very easy to set up. Comfortable to wear. Not too heavy as suggested by others. Radio controlled so always accurate. Rechargeable battery power which is topped up by solar charging. Solid metal/steel bracelet and watch (unlike Casio's other watches which often use resin/composite materials). Only real downside is the "backlight". This is actually a single orange LED at the 6 O'Clock position which barely illuminates the face of the watch. You certainly can't read the digital face with it in the dark. The analogue face has luminous hands which compensate for this but the lack of a proper backlight is otherwise very disappointing for such a watch with otherwise excellent build quality and features. That said: not a deal breaker. Would highly recommend to anyone in need of an easy to use, stylish and feature packed watch. Found no difficulty reading the Casio manual which does have small print (this may reflect my myopia!). An online pdf with large print can easily be used instead if this is a problem. Configuration of the watch took under 1 minute and design very user friendly so no need for the manual most of the time in any case. I have had this watch for several weeks now and have been delighted with it. It came with a sizable instruction manual but I have found it easy to use (many functions/buttons acting in a similar way to my previous casio watch). The size of the watch was originally a concern but its not a problem on my fairly small wrist. The radio updating works perfectly, and so far the solar power has kept the charge well. As other people have reported, the LED light is not very effective but the lumenescent hands are often sufficient on their own. A stylish, low maintenance, multifunction watch; I highly recomend it. To begin with, I didn'y buy this watch from watchshop. Although I used their Q&A service (which is excellent) to help me decide which of the top waveceptors I should go for so I owe this site a review. Everything about the watch. It has Digital/analogue display, Perpetual calendar, Backlight, Radio time calibration, 5 alarms, all the possible time zones, stop watch, countdown timer. Trust me guys, this is the best watch u can buy. If the looks aint for u, there r other models but they ALL lack one feature or the other. Superb watch with easy to use functions and robustly made. It's competitively priced and I love everything about it. The watch is all I was expecting. I sugest to get the pdf user guide on the casio site. The watch looks very cool, with loads of functions & features. Excellent present for my husband. To be honest, I am very much pleased about this watch. It is very stylish and fillled with loads of functions. The radio controlled time keeping is fantastic and the solar powered battery adds more value.the shape of the watch is very good, slightly wider on the right side of the watch give this watch an up market look.I find the countdown timer is slightly complicated to use for the first time, but more you use it, it'll get easier.I believe it can compete with any premium brands. The Casio ECW-M300EDB is an excellent watch for those who travel abroad a lot and require radio control, solar powere, day/date, perpetual calendar, world time, duel time. The watch looks good but some of the dials and lettering are too small to be seen easily in anything but bright light. My main gripe with Casio is the terrible user guide. The type is too small and the whole booklet is flimsy and disintegrates in your hands. Many functions are not fully explained and very few of the various dials and hands are fully described. It takes a while to learn how to operate the watch and you have to be fairly acquainted with the working logic of these watches. Other than that it is recommendable watch and much cheaper than Citizen Watches that lack many of the Casio functions. hope to see you soon! Sorry for my bad English. I am very pleased with this watch! Just what I expected. Delivery in 4 days to Sweden. Perfect. First of all i had no idea that Casio made such stunning looking watches until i started looking for one.It looks well built and sturdy and is packed with features(Atomic time correction,solar power and automatic night light)the list goes on.The only problem i've found with it is that it's near impossible to read digital display in low light but i can live with that.I read a review where it said there was no way of telling how much battery life was left in it but in normal timekeeping mode the left hand dial points it out H(High),M(Medium),L(Low)and C(Critical),mine doesn't see a lot of daylight and the needle hasn't moved from M in a week.a few hours direct sunlight fully charges it fully anyway.All in all an excellent practical beautiful looking watch,well worth the money. It arrived in good time and was received by my wife. I am not in UK presently but my wife seems to really love it. It’s actually supposed to be a Valentine gift from my wife. Yet to get around it but proud of it. The watch, is awesome. Good solid chunky metal bracelet watch with a chronograph, world time, stopwatch, timer :-) Amazing! I like the look of sports watches, the idea of never having to change a battery or worry about a watch's accuracy all appeal, so after a fair amount of investigation I settled on this Edifice model. Its pretty chunky, but not unfashionably so and the overall appearance is pretty classy and teh build quality is very good - its not a plastic casio! You need to read the instructions to set up your home location but it synced with the time sugnal and set itself within 10 minutes. It takes a while to learn the settings but the instructions include handy quick reference guide that can slip into a wallet. If you like the looks (and I accept not everyone will) then this is an amazing amount of watch and tech for the money. I am 100% happy with this watch! It looks as good in life as on picture. Although I love the Watch Shop as a company and am very happy with them, I had to return this watch as I could not read the LCD display in normal light, the pictures show it lovely and clear but in reality its not very useable. I love my new watch, it's awesome. Good solid chunky metal bracelet watch with a chronograph, world time, stopwatch, timer, the full biffda. And its shiny. I love it! Did I say that already? Nice quality looking product good value for money, heavy large watch, I like the duel face design - digital and hands,which is easy to use. Only thing I'd like is a leather strap option or some fine adjustment of the bracelet. I had to get some links taken out at a local shop for a small cost. Nicely finished watch, which sits well on your wrist. The analogue display is easy to read, but the two digital displays are difficult to read unless you are in bright daylight. The solar battery charges the watch very quickly even when there is cloud cover.The accuracy is what you come to expect from a Waveceptor watch. The set up instructions are clear but have to be followed precisely. All in all a nice watch. This Waveceptor is nicely designed and looks pretty cool, the case is big and chunky and the hands are easy to read. The digital display is fairly small but easy to read in normal conditions. The most disappointing thing about this watch is the night light, Casio have moved away from the illuminator style to an orange LED that is located on the 6 marker, this lights the hands enough to see them but the digital display becomes useless in the dark/low light. The watch syncronises it's time every evening (around 2am) so is always accurate and you can check when this happened last at the touch of a button. Overall this is a nice watch, that looks and feels well made, it has many features including stopwatch, timer, world time, dual time and 5 alarms, all which work as you would expect (although the timer will only count down from 60 mins max. Overall I would give it 4/5 due to the light and the timer. The digital display on this watch is very very bad, you can hardly see the writing indoors. It becomes worse outdoors in the sun. I had to return this watch for a refund. Very please with purchase. Fast delivery and well packaged. 5 mins reading book and all is clear. 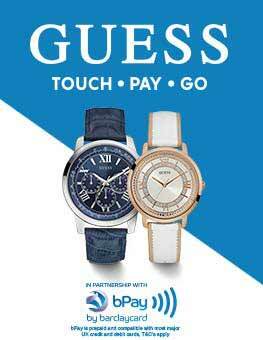 You would pay twice as much for other "branded" watches with not as many functions. Digits are easily to read for those of us with not perfect vision. After a few days of wearing the watch I have noticed 3 people with "double takes"
I'm very happy with this watch. It's a good looking timepiece. I like having a digital readout rather than a mechanical date, but prefer an analogue time. This watch fits the bill perfectly. The digital readout can be difficult to read in subdued light, but is very clear otherwise. WaveCeptor reception is much improved from my previous Casio. The instructions require a little study, but they're perfectly useable. This watch functions well, exactly like what I expected. The world time fits my need to work on oversea market. and the Wave Ceptor it very convenience to keep me on track. An excellent product for a great price. This watch does exactly what I wanted. The styling of a chronograph but with the added practicality of having a digital stopwatch and countdown timer. It can tell you the time in more cities than you'll ever visit and when you change he city or adjust the time the analogue hands adjust themselves automatically! It's a good size watch without being to weighty and is very comfortable. Being solar powered also means no battery to worry about. My only gripe would be that the countdown timer can only be adjusted in full minutes and not in at least 10's of seconds (ie 10, 20, 30 etc) but that is in no way a reason to not seriously consider this watch. I bought the Casio Wave Ceptor for my husband's birthday and I could not be happier. The presentation box is classy and the watch itself looks every inch a quality chronograph. On my husband's wrist it looks like a piece that would cost four times the very competative price I paid. He is delighted with it and has not stopped showing it off since I gave it to him. I will definitly be back for something for me in the very near future. This is the watch we were waiting for :a G-shock caliber in a dress suit,the best of both worlds.Easy to use functions & great style together;wrapped in good quality materials(band & case),the whole at an affordable price.Congratulations to Casio.Go ahead this way. WATCH NICE AND CHUNKY GOOD WEIGHT,NICE FACE AND STRAP,LIKE ANY CASIO THE INSTRUCTIONS ARE NOT THAT EASY GOING,DONT RUSH YOUR GET THERE BY XMAS.VERY PLEASED IN FACT DELIGHTED,SO SYLISH AND DIFFERENT. Service was excellant - came within 48 hours. This is a great watch. Good weight and size (see tea light candle for indication)and I love the black bezel which prevents it looking too bling. All the functions are pretty intuitive to use, just remember to set the correct 'home city' or it will automatically adjust the time in the night and wake you up at an odd time (speaking from experience!). Stopwatch, 5 alarms, solar recharging and auto time correction are all excellent features. Looks smart enough to be worn out in the evening, but not so flashy that you wouldn't wear it to the beach (or work). The light is very cool, although luminous hands are perfectly adequate. The buttons make it easy to use for left or right hand wearers, The only downside that I can see is it is quite hard to see the digital display when it is either half past the hour and/or using the light in the dark, and the links in the chain make it tricky to get an exact sizing for a particularly demanding customer, but both of these issues are minor details in an otherwise fantastic watch. Great watch for great price! It may seem quite clomsy but it actually fits very well. There will be no problems with setting time because the watch does it itself. Digital displays are pretty poor but analog time stands out perfectly. Also characters in digital displays are really small. That may cause some problems if you have poor sight. After all definitely worth to buy! Lovely good looking watch, so classy. I purchased it for everyday wear and its many helpful features are both practicable and useful. At first look it appears overly large but once worn it fits great. LED displays don't illuminate at night. sorry it's been so long re the feedback. I've been in the states delivering the watch I bought from you guys. excellent service and speedy delivery. I knew at all times where my order was. The guy receiving the watch loves it. Thanks. 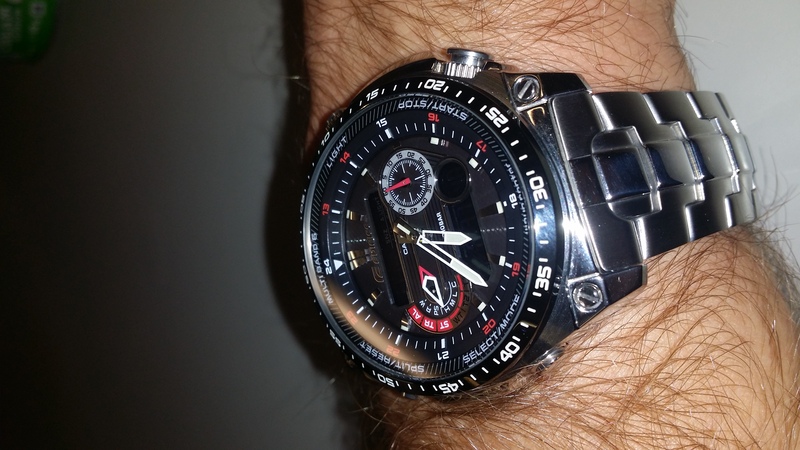 This is a very nice looking watch with lots of complications, as you would expect from Casio. It is easy to use, following the guides in the instruction booklet. With the atomic band link you can get the correct time at any time of the night or day ( no problem in the daytime from Anthorn ) and I was very impressed with the watch except for one thing. This is that being elderly my hearing is not as good as it used to be and I cannot hear the "bleep" on the watch unless it is close to my ear, so I wouldn't recommend it to anyone with poor hearing if they wish to use it as an alarm. I do a lot of timezone changes so this does not bother me, as I use an alarm clock, and the watch being multiband reception is an advantage. Overall a very good watch for a decent price. As for looks, the combination of s/s case and band, black dial and red highlights is not showy and this watch can be worn for all occasions.